Remember How It Felt to Relax in a Restaurant? Do you remember that feeling? Deciding on the way home from work that you were too tired to cook, calling a loved one to join you, and sighing with contentment as you settle into the restaurant chair. You open the menu and have more options than you can possibly eat, with no fear of retribution. It's just about enjoying the food, the conversation, and the service. Wouldn't it be great to feel that again? That's the goal of this guide. When you're on a healing diet, restaurants are no longer safe havens. They are a minefield of potential food triggers, menus filled with food you can't eat, and staff who often don't understand your needs even when you try to make them clear. One wonderful benefit to the growing paleo movement is that there are culinary entrepreneurs among us! However, they are rare. I'm honoring them in this post. Just because a restaurant says it's paleo doesn't mean it truly is. When I double-checked menus, I found lots of non-paleo ingredients. Some “paleo” restaurants even had wheat on the menu – crazytown! In the end, I came up with three categories. The first list are restaurants that truly are 100% paleo. The second list are 100% gluten-free restaurants with a paleo philosophy. The third list are 100% gluten-free restaurants where at least half the menu can easily be adapted for the paleo diet. Any restaurant that served gluten in any form – no matter their name – didn't make the lists. For those of you following the paleo autoimmune protocol, I also made notes below on how AIP-friendly each restaurant is. Note: In each section, restaurants are listed alphabetically by US state first, then alphabetically by other countries. Last updated 3/22/19. 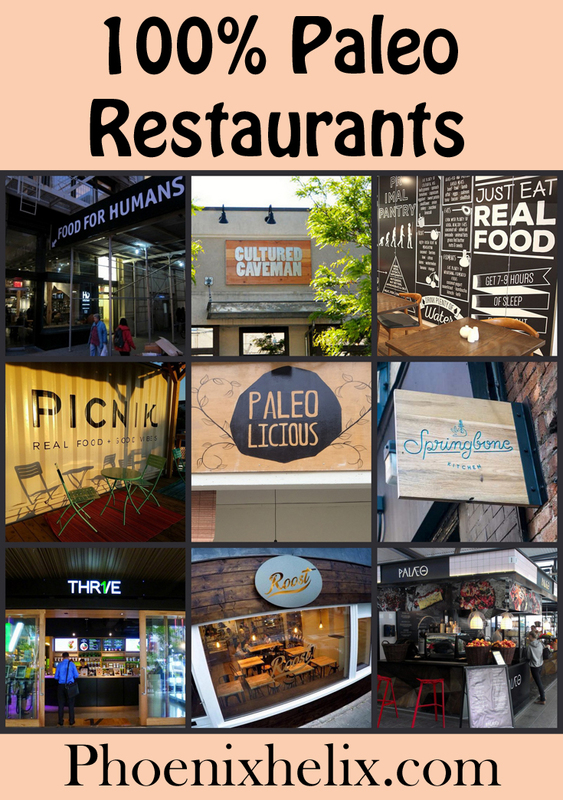 100% Paleo Restaurants. Woot Woot! You read that right. This is a list of restaurants where everything on the menu is 100% paleo. That means the menu is free of all grains, gluten, legumes, dairy, soy, refined oils, refined sugars, and processed and artificial foods. The focus is on high-quality real food: fresh vegetables, high quality meat and seafood, healthy fats, and paleo-friendly herbs and sauces. In other words: Restaurant Heaven. It's a small list (and honestly it's gotten smaller since I first wrote this post in 2017). Niche restaurants are a challenging business, so if you live near one of these, visit them today! Cultured Caveman in Portland, OR – This restaurant began as a kickstarter project to become one of the first 100% paleo restaurants in the United States. They pride themselves on accommodating people with food restrictions, so ask their help if following AIP. They even make it easy by having a website menu where you simply click on an item to see the full list of ingredients. Festal Paleo Café in Vancouver, Canada – This is the first 100% paleo restaurant in Canada. They began as a meal delivery service and expanded to a restaurant location in 2017. 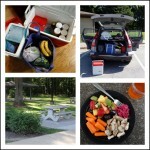 Their goal is to feed people for both health and joy, and they have a wide and varied menu. For AIP, ask the staff to help you modify your order. Palaeo – Primal Gastronomi: 7 locations in Denmark – Peter Emil Nielsen is on a mission – to create healthy, fast food around the world. He's starting with his home country of Denmark, but that's not where he plans to finish. The menu is 100% paleo with 1 exception: you can order cheese as a topping or milk in your coffee, but neither is automatically included in any meal. I've spoken with Peter and he said patrons can definitely adapt the menu to AIP, but you need to be clear with his staff, because they won't know what AIP means. Primal Roost in Surrey, England – This casual breakfast and lunch café is 100% paleo with one exception: they offer grass-fed butter as an optional addition to coffee. Since the food is cooked off-site, they can't accommodate special orders. However, people following the AIP should be able to put together an AIP-friendly salad with the staff's help. Paleolicious in Kuala Lumpur, Malaysia – Keeping our international flavor going, this restaurant has a beautiful mission: To create a healthier and happier world. They list ingredients on their menu, but for AIP, you'll have to ask the staff to clarify the spices used. Sapiens Paleo Kitchen in Scottsdale, AZ – This dinner restaurant blends a paleo philosophy with French cuisine. Dairy is the only non-paleo item on the menu, and everything can be ordered dairy-free. They make all of their food in-house from scratch, including their sauces and paleo breads. They also pride themselves on accommodating special diets, so if you're following the AIP, ask the staff to help you adapt your order. Bulletproof Coffee Shop: 3 locations in CA & WA – This coffee shop serves breakfast, lunch and dinner as well. Their menu is mostly paleo, with rice and dairy being the exceptions. However, since grass-fed butter and ghee are signature ingredients in the “bulletproof” brand, they use it as their primary cooking fat. You can request to have a meal prepared with coconut oil instead, but since many items are stocked pre-cooked, this is a better restaurant for people who follow a primal diet and have reintroduced butter successfully. Nectarine Grove in Leucadia, CA – 90% of the menu at this little café is paleo, with a few non-paleo options to satisfy vegan customers (legumes, dairy, and gluten-free grains). There's a clear allergy key on the menu, with P standing for paleo. You'll find salads, burgers, bowls, breakfasts, paleo pizzas, bone broth, kombucha and kefir on tap, as well as an in-house bakery. For AIP, ask the staff to help you adapt your order. Snackin' Free in Murrieta, CA – The owner of this bakery-café has rheumatoid arthritis herself and turned to the paleo diet and lifestyle for own health. She opened her business to help other people with the same needs. The dine-in menu includes soup, salad, paleo sandwiches and paleo pizza. The only non-paleo item on the menu is Daiya cheese substitute (which includes canola or safflower as one of the ingredients). For AIP, your best bet is to order a custom salad and be sure to clarify ingredients in the dressings or bring your own. Kitava in San Francisco, CA – This new restaurant began as a meal delivery service and expanded to a seated restaurant in 2017. They believe in transparency, so just click the meal photos on the website to see the full list of ingredients. The only non-paleo items on the menu are white rice and legumes, but they're optional and they offer paleo alternatives. They also have an AIP menu, and they know the protocol inside and out. Their AIP offerings are grain-free, legume-free, dairy-free, egg-free, nightshade-free, nut-free, and seed-free. There's even a key at the bottom of the menu noting where black pepper is included in a dish (a stage one AIP reintro), and which dishes can be prepared without it. Primal in Santa Cruz, CA – I love how this restaurant describes their food: optimal quality, nutrient dense, locally sourced, ancestrally inspired, beautifully presented, and addictively tasty. They even soak and sprout their nuts and seeds for optimal digestibility. The only non-paleo item on the menu is dairy, so if you have a dairy sensitivity, be sure to ask about cooking fats when placing your order. They don't have an AIP menu, but the menu is large, and they should be able to help you create a meal that suits your diet. Mmmm…Coffee in Denver, CO – Despite it's name, this is more than a coffee shop. They sell soups, salads. smoothies and wraps, along with paleo treats. None of the treats are AIP, but the salads and smoothies can easily be adapted. Grass-fed butter is the only non-paleo item on the menu, and it's used in just 3 things: butter-roasted pecans, primal cheesecake, and as an optional addition to coffee. Kara Lynn's Kitchen in Clearwater, FL – This small restaurant was inspired by an AIP success story. The menu is mostly paleo, with quinoa being the only grain offered and the occasional use of dairy. While the menu isn't AIP, the staff should be familiar with the protocol. Paleo Connection in Sarasota, FL – This little restaurant serves breakfast and lunch with a menu that changes daily. Follow their Facebook page for menu updates. The only non-paleo item on their menu is ghee. Since it is a small menu, AIP orders might not be possible. Talk with staff to see if you can place a special order. Cavé: A Paleo Eatery in Avon-By-The-Sea, NJ – This restaurant is mostly paleo, the only exception being the use of ghee and grass-fed butter. If you're dairy intolerant, confirm the cooking fat used with the staff. For AIP, you'll likely need to adapt your order. While the menu says no substitutions, I believe as members of the paleo community, it's reasonable for people with autoimmune disease to make special requests here. Mention the paleo autoimmune protocol to the staff. Hu Kitchen in New York City, NY – Another great restaurant built on the philosophy that food can be medicine. The majority of the menu is paleo and much of it can be adapted to AIP. There are a few non-paleo options, including oats, quinoa, and legumes. The only dairy on the menu is grass-fed butter as an optional addition to coffee. Springbone Kitchen in New York City, NY – The menu is primarily paleo, centered around bone broth, and easily adapted to AIP. Non-paleo items include wild rice, gluten-free breads, legumes and some dairy. However, they are all clearly marked on the menu and they offer paleo substitutes (like cauliflower “rice”). Primal Food and Spirits in Durham, NC – While built on an ancestral philosophy, this restaurant is more primal than paleo, with dairy featured heavily in its menu. Other non-paleo items include gluten-free bread and pasta, as well as corn. However, the staff is specifically trained to know all of the ingredients in each dish and to accommodate food allergies. For strict paleo or AIP, ask for help modifying your order. Picnik in Austin, TX – Picnik is famous for being the food truck connected to PaleoFx. This year they expanded to open a full restaurant, making paleo Austinites very happy. The only non-paleo items on the restaurant menu are dairy and white rice, and both are marked clearly. Not only that, but an AIP menu is available upon request. Gather Paleo Café: Port Neches, TX – This little café is open for lunch Tues-Sat, with a menu that changes every week. The only non-paleo item on the menu is dairy, but they always have at least one dairy-free option available. Since the menu is small and frequently features nightshades, AIP options may not be available. Revolve in Bothell, WA – Another great paleo-centric restaurant, the only non-paleo item on the menu is dairy. For AIP, clarify ingredients and adapt where necessary. Carnivore in Seattle, WA – As quoted from their menu, they offer “an evolutionary approach to progressive American fine dining.” The only non-paleo item on the food menu is grass-fed butter. Their drink menu has a combination of paleo and more conventional options. Ask the waitstaff to help you adapt the menu for AIP. Wilde Kitchen in Brisbane, Australia – This breakfast and lunch café was also founded on a paleo philosophy. Non-paleo items on the menu include dairy, gluten-free grains and chia seeds. However, their menu contains many strict paleo offerings, and has a clear allergen key. For AIP, you'll have to adapt the menu; clarify ingredients with the staff. This café also gets bonus points for nutrient-density: many of their meals include fermented vegetables, and they boost their smoothies with collagen and their bone broth with liver powder. Seedling Café in Melbourne, Australia – All food at this casual breakfast and lunch café is paleo-inspired, gluten-free and refined sugar-free. Non-paleo items include quinoa, dairy, peanut butter, and gluten-free bread. Since eggs, nuts and seeds feature heavily on the menu, it may be challenging to eat AIP here. But perhaps you can order something off-menu. Rough and Bare in Mona Vale, Australia – This restaurant's mission is to “create meals the way nature intended.” The only non-paleo item on their menu is quinoa, and dairy is an optional choice on their drinks menu but not used in regular cooking. Fermented foods also feature heavily, and they have a reputation for being able to accommodate AIP requests. Café Umami in Tasmania, Australia – Founded on a paleo philosophy, this restaurant has an excellent reputation for delicious meals and knowledgeable staff. Unfortunately they don't have a menu online, so I couldn't verify the details. If you visit, ask the staff to help you choose a meal to fit your needs, whether it be strict paleo or AIP. Von Walden in Vienna, Austria – This restaurant is built on paleo ideals but with a few primal tweaks. Grass-fed butter and ghee might show up as ingredients, so if you're dairy-intolerant, ask questions. I'm also told the owner is familiar with the AIP, but the menu is very small, so he may or may not be able to accommodate on the day of your visit. It's worth asking, though! Also be aware that seating is limited. This is a tiny place. The Simple Kitchen in Toronto, Canada – Built on a paleo philosophy, the vast majority of the menu is paleo. As their name suggests, they focus on simple, build-your-own meals, made with fresh, unprocessed ingredients. This includes breakfast, salads, smoothies, soup, and protein+veggie boxes. They even make their own paleo dressings and bone broth, and they also sell kombucha on tap! They do offer a few vegan menu options that include things like brown rice, legumes, oats, soy, and gluten-free bread. For AIP, you might be able to eat here, but you'll need to clarify the spices used when cooking the ingredients. For salads, they offer a simple oil & vinegar dressing. Sow & Arrow in Clevedon, England – Owned by a nutritionist who believes in ancestral health, this breakfast and lunch café has many paleo and keto offerings. The only non-paleo items on the menu are quinoa, chickpeas, and dairy (but they are all clearly marked). It might be tricky to eat AIP here, due to the seasonings and sauces. Ask the staff if they can prepare a special order. The Willow in London, England – This restaurant has one of most impressive allergy keys on a menu I have ever seen, and much of the menu is paleo. Non-paleo items include gluten-free bread, dairy and legumes, but everything is clearly marked. They even have Low-FODMAP options. You'll have to adapt your order for AIP, but I have faith this restaurant can do it well. Simply Keto in Berlin, Germany – This café is based on a paleo ketogenic philosophy. The only non-paleo items on the menu are grass-fed butter and stevia/erythritol (calorie-free sweeteners). Cycle Bistro in Dubai, UAE – Quinoa is the only non-paleo item on the menu of this little café. Otherwise everything on the menu is 100% paleo. If following AIP, ask the staff to help you modify your order. These restaurants weren't started by paleo chefs, and they might not even know what paleo means, but they do believe in a safe, gluten-free dining experience. Like all of the restaurants in this entire blog post, gluten isn't allowed in these kitchens at all, which is so much better than a regular restaurant with a gluten-free menu. Why? Because there's no risk of cross-contamination – It isn't possible to get “glutened” here. The other requirement for this list is that half of their menu has to be paleo-friendly, meaning it can easily be adapted to the paleo diet with a few minor changes. (No more searching menus for one sad, flavorless option.) Lastly, I only chose restaurants that care about the quality of the food, sourcing local, organic, sustainable, wild-caught and grass-fed ingredients whenever possible. This is the cream of the gluten-free restaurant crop. Mason Dixon Bistro in Huntsville, AL – This little bistro began as a gluten-free bakery and then expanded to include breakfast and lunch. Their menu includes a key: P, DF, EF, V, SF. P stands for Paleo. However, it would appear that they don't consider goat cheese to be dairy, so if you're truly dairy-intolerant, you'll want to confirm ingredients when you place your order (this is true when it says DF for Dairy-free on the menu also). For AIP, salads are your best bet, but you will need to make some modifications and clarify dressing ingredients. Asian Box: 8 locations in CA – This “build a plate” restaurant specializes in Asian flavors. Everything on the menu is gluten-free and dairy-free, with exception of an optional addition to coffee. Since everything is made in-house, including the sauces, you should be able to ask for a complete ingredient list to help you choose paleo and/or AIP. Note: The Asian Box is designed to be a takeout restaurant. Honey Hi in Los Angeles, CA – This little café is open for breakfast and lunch, and everything on the menu is gluten-free, gmo-free, vegetable oil-free, and refined sugar-free. From there, they focus on seasonal, high-quality, real food. The menu looks easily adapted to paleo, but since nightshades feature heavily, you'll have to make special requests for AIP. Also, since they're not dairy-free, be sure to ask whether ghee or butter is used in the preparation. Pushkin's Restaurant in Sacramento, CA – This little breakfast and lunch place isn't paleo to begin with, but it has a menu that can be easily adapted. Just clarify ingredients and make substitutions as necessary. For AIP, a special-order salad is your best bet. As Quoted in San Francisco, CA – This breakfast and lunch café was founded on the belief that food can be medicine. In addition to being 100% gluten-free, most of their menu is also dairy-free, nut-free, and soy-free. They feature local seasonal vegetables, pastured meat and eggs, bone broth-based soups, as well as salads and sandwiches. While not a paleo restaurant, there are plenty of paleo options. Just clarify ingredients with the staff and adapt your order accordingly. Little Gem in San Francisco, CA – This farm-to-table restaurant is 100% gluten-free, dairy-free and refined sugar-free. The menu is easily adapted to the paleo diet. Just ask questions to clarify ingredients, especially if following AIP. Kye's in Santa Monica, CA – This is a restaurant that specializes in “sandwiches without the bread.” Instead, each is wrapped in either nori, romaine, or collard greens. You can order any of them “paleo-style” where they remove the rice and add a cauliflower/almond meal mash. For AIP, ask questions to help you modify your order. Oceans and Earth in Yorba Linda, CA – Much of their menu is easily adapted to paleo and with careful ordering, AIP should be possible. This restaurant also has a unique focus on nutrient-density. They have trademarked the name Living Salad: The greens for their menu are harvested from their own greenhouse in the morning with their roots intact, and not fully picked until right before serving, to retain maximum nutrients. Fresh Thymes in Boulder, CO – Christine Ruch, the owner of this restaurant, has celiac disease and multiple sclerosis and understands the power of food as medicine. The only oils used are coconut oil and extra-virgin olive oil. They pride themselves on being allergy-friendly, and the menu includes plenty of paleo options. Ingredients are listed in detail, along with allergy notes if a dish includes nuts or soy. 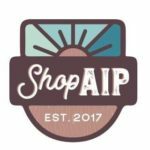 Ask the staff questions when modifying your order for AIP. Shine in Boulder, CO – This is another restaurant that prides itself on offering healing diets for everyone, from vegan to paleo. There are plenty of paleo options on the menu, and they're marked with a little red circle that says PF for paleo-friendly. However, some of these items include dairy or miso, so for strict paleo or AIP, you will need to modify your order. Seoul Spice in Washington, DC – This “build your own meal” restaurant focuses on Korean cuisine. For paleo, build a salad, and add protein, veggies, sauce, and toppings. Since all of the meat appears to be pre-marinated, you may not be able to eat AIP here. Ask about the ingredients. Eat Fresh Kitchen: 4 locations in FL – Another “build your own plate” restaurant with lots of paleo options. For AIP, ask the staff to clarify the ingredients. T. Loft: 4 locations in KS & MO – This chain of health cafés offer fresh-pressed juices and simple meals made from whole food ingredients. They actually have a “Primal Bowl” on their menu, which is their automatic paleo option (it's also dairy-free.) But since they make each meal to order, they should be able to adapt many menu items for paleo and AIP customers. Gluten Free Miracles in Lexington, KY – Originally a bakery, they expanded to offer breakfast and lunch. Their menu includes a paleo bread option for sandwiches and a paleo pizza crust option as well. However, they sometimes run out of these selections, so they recommend calling in advance to verify what's in stock. For AIP, salad is your only option – just ask them to skip the nuts and clarify salad dressing ingredients. Brightwok Kitchen in Chicago, IL – This restaurant is 100% gluten-free, dairy-free and peanut-free. The cuisine is Asian-inspired, and you “build your bowl”, choosing your base, protein, vegetables and sauce. You can definitely build a paleo bowl, but many of their sauces contain soy. If strict paleo or AIP, just bring your own sauce. I especially like that each bowl comes with your choice of 4 vegetables in addition to your protein. After all, vegetables are the base of the AIP food pyramid. High Tide Poke in Chicago, IL – This “build your own meal” restaurant is based on the Hawaiian Poke tradition, featuring raw fish as the protein. Everything on the menu is gluten-free, dairy-free, and nut-free. For paleo, choose zucchini noodles or greens as your base, and avoid the marinated fish since it's usually marinated in soy sauce. Most of the toppings are naturally paleo. They make their dressings in-house, so ask them about the ingredients. For AIP, you might need to bring your own sauce. Sassy Spoon in Minneapolis, MN – This fast-casual restaurant isn't paleo, but it's definitely real-food friendly. Their beef bolognese is served over spaghetti squash, their pizza is built on a yuca crust, and both their waffles and biscuits are grain-free. However, they don't limit themselves to all paleo ingredients, so ask the staff questions to help you place a strict paleo or AIP order. Inday Restaurant in New York City, NY – This “build your own bowl” restaurant focuses on Indian flavors. You choose your base, proteins, sides, garnishes and “crunch”, and they have some great variety in their bases including cauliflower “rice” or a roast squash “steak”. This looks easily adaptable to paleo, but I recommend asking questions, especially if you're AIP as nightshades feature highly in Indian cooking. Oca in New York City, NY – This unique Brazilian restaurant creates skillet meals that start with tapioca starch to create the “oca” – a paper-thin pancake. You then add your choice of toppings. They have a large à-la-carte menu, allowing you to easily choose a paleo plate with AIP options as well. The only non-paleo items on the menu are corn and dairy. The Little Beet: 6 locations in NY and DC – This casual eatery prides itself on accommodating diverse dietary needs. The restaurant is 100% gluten-free, and from there you can go to their website and filter their menu for dairy-free, soy-free, etc. to get a sense of how to build your paleo plate. There is no nightshade-free filter, so AIP-ers will need to ask questions before ordering. Little Beet Table: 2 locations in NY and IL – While named similarly to the restaurant above, this is an upscale restaurant with completely different owners. The menu is easily adapted to paleo or AIP, but you'll have to communicate well with your waitstaff when you order. Five on Black: 5 locations in MT & CO – Are you sensing a theme with the 100% gluten-free “build your own meal” restaurants? They're great, because it makes it much easier to accommodate special diets. This restaurant focuses on Brazilian flavors. 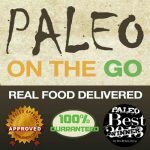 You can definitely order paleo here, but since much of the menu automatically includes spices, you'll need to ask the staff questions to modify your order for AIP. Posana in Asheville, NC – This upscale restaurant creates it's menu from this philosophy: “Nourish everyone who walks through our doors.” The chef's wife has celiac disease, which inspired them to make the restaurant 100% gluten-free. With the focus on fresh food, much of the menu can be adapted to paleo, but you will need to make your requests very clear with the staff. Dairy features prominently in this menu and is likely the default cooking fat unless you request otherwise. They also have an excellent reputation for accommodating AIP requests. Fresh Levant Bistro in Raleigh, NC – The owner of this restaurant has autoimmune disease and I'm told she follows the AIP herself. However, nothing on the menu is automatically AIP. Everything is gluten-free, soy-free, and non-GMO. From there, the menu is coded for dairy-free, nut-free and egg-free selections (but they rarely overlap). If you ask questions and clarify ingredients, you should be able to adapt a good portion of the menu to paleo. However, AIP is trickier here. Almost nothing on the breakfast menu looks adaptable, and only a few items on the dinner menu. However, I'm told they will work with AIP customers to help them find a meal they can safely enjoy. Joule Crafted Nutrition in Portland, OR – This breakfast and lunch café is a nutrition-based restaurant, specifically designed to serve people who follow healing diets, including paleo, AIP, WAPF, GAPS, and Low-FODMAP. They serve build-your-own skillets, toasts, smoothies, acai bowls, and bone broth. Over half the menu is paleo, but talk to the staff to clarify ingredients. Non-paleo items include legumes as well as gluten-free grains (used in their waffles and bread), but they do have grain-free tortillas and are seeking a source of grain-free bread. For the AIP crowd, they make sure at least one of their daily specials is nightshade-free, and many of their seasoning blends are AIP-friendly, too. Always double-check with the staff, though; if necessary the kitchen is happy to prepare a special meal for you. Verde Cocina in Portland, OR – A gluten-free restaurant with a Mexican flair, they go out of their way to help people with special diets. They use a PF code to note paleo-friendly options on their menu, but they often require adaptations. Since nightshades feature heavily in Mexican cuisine, people following the AIP will need to ask if the chef can prepare a nightshade-free meal. Agno Grill in Philadelphia, PA – This “build your own plate” restaurant focuses on Mediterranean flavors. To make a paleo meal, start with salad as your base. You'll have a choice of meat and vegetable toppings. When it comes to sauces, they have both paleo and AIP options. Just clarify ingredients with the staff. Bedrock Eats & Sweets Market Café in Memphis, TN – Dairy features heavily on the menu, and some entrées contain corn or oats, but this restaurant does lean toward a paleo philosophy. Avoid the waffles (they contain whey protein and soy lecithin), but with help from the staff, you should be able to find a strict paleo offering elsewhere on the menu. I don't recommend this restaurant for people following the AIP, since eggs and nightshades also feature heavily in their recipes. Bounty on Broad in Memphis, TN – This upscale restaurant has a menu that changes seasonally, and everything is served family-style. That means it's the perfect place to go with a group of friends, in order to sample more of the menu. It's also “quietly gluten-free”, meaning many people who eat there don't realize that no gluten ever crosses the threshold. They're simply eating delicious, farm-to-table meals. Company Café in Dallas, TX – Open for breakfast and lunch, this restaurant has two items labeled paleo on the menu and many more that can be adapted. However, they specialize in gluten-free comfort food, which means there's a lot of non-paleo gluten free bread, bread crumbs and batter used in recipes. Be sure to clarify ingredients when placing your order, especially if you're AIP. Gather Kitchen in Dallas, TX – This restaurant is 100% grain-free, dairy-free, and refined sugar-free. Paleo labels are are marked clearly on the menu, and they even have Whole30 options. It's a “build your own bowl” restaurant. You choose a base, veggies, protein, sauce, and garnish. For AIP, ask questions about the spices used in cooking, and bring your own sauce. Pok the Raw Bar in Dallas, TX – This restaurant provides “sushi in a bowl”. Fresh fish is flown in daily, and they try to source their vegetables locally whenever possible. Everything's gluten-free, and they offer 3 paleo bases (cauliflower “rice”, kale, and kelp/zucchini noodles), 2 paleo proteins (tuna and salmon). The sauces are the wildcard, because they don't list ingredients on their website. For paleo, clarify ingredients when making your selection. For AIP, I recommend bringing your own sauce. Vibrant in Houston, TX – Open for breakfast and lunch, this restaurant is gluten-free, dairy-free, refined sugar-free, non-GMO, and refined oil-free (they only use coconut, avocado and extra-virgin olive oil). Paleo options include soups, salads, eggs, salmon, and house-made sausage. Their breads and pancakes aren't paleo (made with gluten-free grains and legumes), but their pastries are made with coconut and nut-based flours. For AIP, double-check ingredients, but it looks like their Golden Bone Broth Soup is AIP, and their salads can be adapted as well. Capitol Cider in Seattle, WA – This upscale restaurant is both gluten-free and peanut-free, and they state on their website that they know all of their ingredients and are therefore able to cater to food sensitivities. There are plenty of paleo options on the menu, and the staff should be able to help you verify ingredients or adapt an order for AIP. For those of you who have been able to reintroduce hard cider, they are the largest independent cider bar in the USA, with 20 rotating varieties on tap, and 200 cider options in bottles. Hard cider is naturally gluten-free. Niche Café & Bakery in Seattle, WA – The owner of this breakfast & lunch café is paleo herself, but since she also accommodates vegetarian customers, the menu is varied. However, there are plenty of paleo options clearly labeled on the menu, and a detailed allergen chart on their website. For AIP, your best bet is the hash bowl, but you will have to communicate with the staff to omit nightshades and clarify the spices uses. GrabbaGreen: 20 locations throughout USA – This is an exciting chain because they are adding new locations all the time. Their menu is gluten-free, GMO-free, hormone-free, and antibiotic-free. Their proteins are seasoned very simply with olive oil, sea salt, and black pepper. To make a paleo meal, choose the build-your-own option and bring your own dressing. (Their dressings contain non-paleo ingredients, such as soy, seed oils, dairy, and agave, in addition to nightshades.) If you're AIP, you'll want to have reintroduced black pepper successfully to eat a full meal here, but for strict AIP, you can get a smoothie or side salad with fruits and veggies only. Caffé Strada in Melbourne, Australia – This little restaurant began as a bakery and expanded to a café that serves breakfast and lunch. You will need to adapt the menu for paleo or AIP, but it has plenty of possibilities. Ask questions to clarify ingredients. Primal Pantry in Perth, Australia – This casual café is founded on a clean-eating philosophy. Everything's gluten-free, dairy-free and refined-sugar free, while also prioritizing nutrient-density. However, in spite of their name, this isn't a paleo restaurant. Non-paleo menu items include a variety of gluten-free grains, pseudograins, legumes, and miso. That said, with modifications you have a lot of potential paleo options here. Just be sure to clarify all ingredients when ordering, especially if you're AIP. Gasthaus Zum Wohl in Vienna, Austria – This restaurant is 100% gluten-free and while they advertise also being 100% lactose-free, that's not the same as dairy free. They do have cheese and clarified butter on the menu. They also have an allergen key and I've been told that P stands for paleo, but that tag is listed next to the cheese plate and many bread options. So, definitely clarify all ingredients when placing your order. If you communicate well with your server, many of items look easily adapted to paleo. Impact Kitchen in Toronto, Canada – This restaurant is where real-food vegan and paleo diets intersect. The meals start with vegetables and flavorful non-dairy sauces, with meat and seafood options for the paleo crowd and gluten-free grain and legume options for the vegan crowd. The only dairy on the menu is butter and whey protein as optional additions to beverages. They also have a reputation for accommodating AIP requests. Just clarify ingredients with the staff and adapt your order accordingly. Farmstand in London, England – This casual eatery is gluten-free, dairy-free, and refined sugar-free. The menu looks quite paleo-friendly, and it's based on an à-la-carte model. You choose your main course and 2 side dishes. Just confirm ingredients with the staff and modify accordingly. Since the food appears to come pre-spiced and marinated, it might be challenging to eat AIP here. Power Kitchen in Wigan, England – Specializing in healthy fast food, the menu is gluten-free, refined sugar-free, and refined oil-free. Founded by a professional athlete and registered nutritionist, their goal is to feed people using nutrition for health, and they accommodate paleo, ketogenic, vegetarian and vegan diets. You can find the menu and a downloadable allergen key on their website. For AIP, choose the Power Box build-your-own meal option, and bring your own dressing. Noglu in Paris, France – This little café is 100% gluten-free with dairy-free options. The menu is small and changes daily, but they always have a burger and salad on the menu, which can be combined for a paleo meal. Just be sure to clarify ingredients with the staff. Since much of the menu is prepared in advance, it might be hard to eat AIP here. La Otilia in Mexico City, Mexico – According to their website, this is the only 100% gluten-free establishment in Mexico. They are a bakery, but they also have an all-day meal menu with a detailed allergy key. None of their baked goods are paleo, because their flour mix includes amaranth. For paleo options, eggs and salads are your best bet, but you'll need to work with the staff to modify your order. (The standard menu combinations usually include some non-paleo ingredients.) The website says they want to promote a nutritious and healthy diet for everyone and are willing to work with clients with special dietary restrictions. For AIP, try a special-order salad and request simple olive oil and lemon for your dressing. In the Pink in Malmö, Sweden – Another restaurant with a real-food philosophy that strives to accommodate both vegan and paleo diets. Some of the menu is paleo “as is” and other items are easily adapted. For AIP, clarify ingredients and modify your order as needed. Tawa Bakery and Restaurant in Abu Dhabi, UAE – A 100% gluten-free bakery that also serves breakfast, lunch and dinner. There is no paleo key on the menu, but there are plenty of options that look paleo-friendly (and even AIP-friendly) if you clarify ingredients and adapt accordingly. I put these in a separate list, because they have limited hours and limited menus, and you don't get the added relaxation of sit-down service. However, they are still a great option for quick, inexpensive, paleo food. Jurassic Cart in Portland, Or – Open Tues-Fri for lunch & dinner. The only non-paleo item on the menu is goat cheese. You'll have to adapt the menu for AIP, but they advertise that they are happy to accommodate dietary needs and preferences. Picnik is Austin, TX – Open 7 days a week, the only non-paleo items on the menu are quinoa in one meal and grass-fed butter is an optional addition to coffee. However, all of the food is prepared in advance and therefore cannot be modified. The only AIP option is bone broth. AIP-ers will have better luck at their full restaurant location (see above). Mitchel's Paleo Food Truck in Antwerp, Belgium – Open Thursdays and Fridays and 100% paleo. The menu changes daily, so you'll need to ask if they can accommodate AIP. 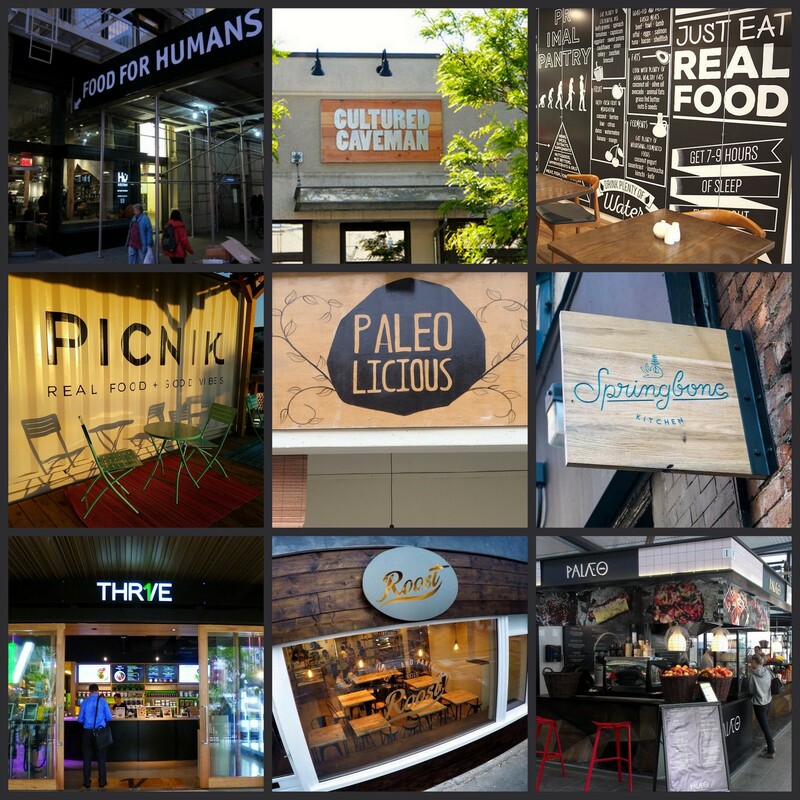 Elemental Eats in Wellington, New Zealand – 100% paleo, they move around to various locations. Follow their Facebook page for details. Nightshades feature heavily on the menu. Whether they can accommodate AIP will depend on how much of the food is prepared in advance. Craved by Caveman in Melbourne, Australia – Australia's 1st 100% paleo food truck, they also move around to various locations. Follow their Instagram page for details. Whether they can accommodate AIP will depend on how much of the food is prepared in advance. The majority of new restaurants fail within the first 3 years, and when you're catering to a niche audience you're taking a higher risk. Let's thank these restaurants and keep them in business! We can't expect them to be there for our birthday, if we don't support them throughout the year. If you're lucky enough to live nearby, become a regular customer. For the rest of us, we have a wish list of places to visit. 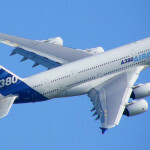 Time to plan some travel! I would love to expand this list, but my standards are high, my friends! There's a reason this list is special. If you know of a restaurant that meets the following requirements, comment below. In order to make the list of 100% paleo restaurants, every item on the menu has to conform to a strict paleo template. In order to make any of the lists, the restaurant has to be 100% gluten-free. That means no wheat anywhere on the menu. Having a “gluten-free menu” is not enough to qualify. At least 50% of the menu has to be paleo-friendly. No gluten-free pizza, pasta or vegan food joints. It has to be a restaurant that serves meals (not a bakery, juice shop, coffee shop, etc.). The restaurants on these lists include food trucks, cafés and upscale eateries. The one thing they all have in common is that you can spontaneously stop by and grab a meal. While there are great paleo catering and meal delivery services, they require advance ordering and therefore don't qualify for this list. I realize that you might have a favorite restaurant that doesn't meet this criteria. That's OK! It is indeed possible to find local places that can accommodate our special diet, and it's a real gift when that happens. Here's the thing, though: In restaurants, there are a lot of staff involved with food preparation, and it's really easy for one to make a mistake or simply be misinformed. The less allergy-friendly the restaurant, the higher the risk of exposure to intolerant foods. I created this post to discover the places where relaxation can be returned to our restaurant experience. These restaurants are the dream! Research restaurants in advance. The Eat Well Guide helps you find farm-to-table restaurants, which serve high-quality food and are more likely to accommodate special dietary needs. Find Me Gluten-Free is a smartphone app where customers rate restaurants on their gluten-free options and safety measures. Look at the menu like everything is available à-la-carte. Most of the menu items will include foods you can't eat, but you can likely find a meal you can create. Keep it simple. Don't talk about your diagnosis or every single ingredient that affects you negatively. Instead scan the menu for something that you believe you can eat, and then ask your server to check with the chef regarding any potential hidden ingredients that you can't eat. For me, I always have them doublecheck it's gluten, dairy and nightshade-free, and I explain this means no butter and no red pepper spices, including paprika. Your list might be different.